When used in conjunction with the VOR system, DME makes it possible for pilots to determine an accurate geographic position of the aircraft, including the bearing and distance TO or FROM the station. The aircraft DME transmits interrogating radio frequency (RF) pulses, which are received by the DME antenna at the ground facility. The signal triggers ground receiver equipment to respond to the interrogating aircraft. The airborne DME equipment measures the elapsed time between the interrogation signal sent by the aircraft and reception of the reply pulses from the ground station. This time measurement is converted into distance in nautical miles (NM) from the station. Some DME receivers provide a groundspeed in knots by monitoring the rate of change of the aircraft’s position relative to the ground station. 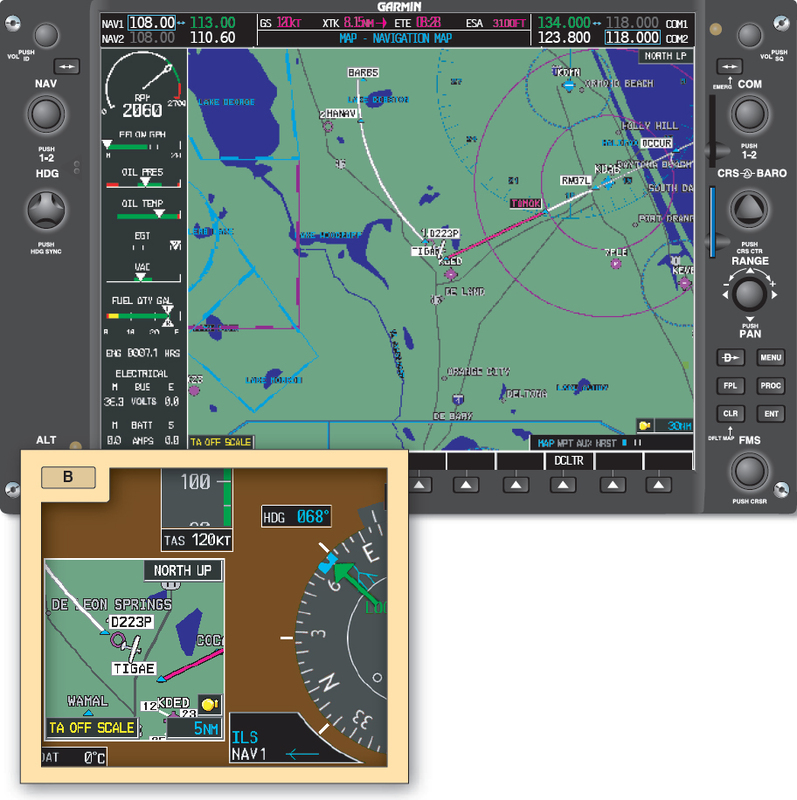 Groundspeed values are accurate only when tracking directly to or from the station. 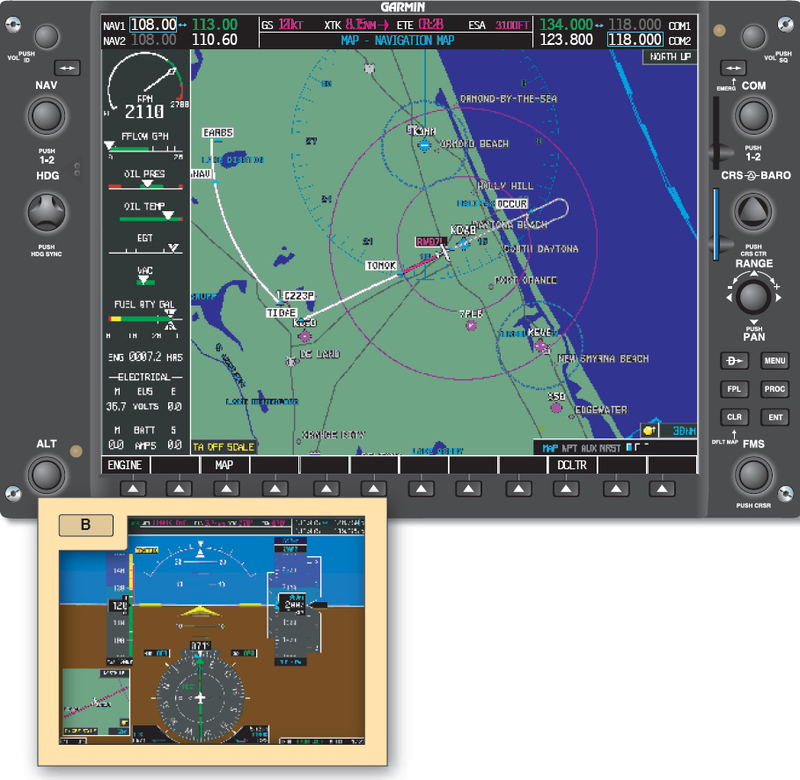 VOR/DME, VORTAC, ILS/DME, and LOC/DME navigation facilities established by the FAA provide course and distance information from collocated components under a frequency pairing plan. DME operates on frequencies in the UHF spectrum between 962 MHz and 1213 MHz. Aircraft receiving equipment that provides for automatic DME selection assures reception of azimuth and distance information from a common source when designated VOR/ DME, VORTAC, ILS/DME, and LOC/DME are selected. Some aircraft have separate VOR and DME receivers, each of which must be tuned to the appropriate navigation facility. The airborne equipment includes an antenna and a receiver. Many DMEs are channeled by an associated VHF radio, or there may be a selector switch so a pilot can select which VHF radio is channeling the DME. For a DME with its own frequency selector, use the frequency of the associated VOR/ DME or VORTAC station. The DME identifier is heard as a Morse code identifier with a tone somewhat higher than that of the associated VOR or LOC. It is heard once for every three or four times the VOR or LOC identifier is heard. If only one identifier is heard about every 30 seconds, the DME is functional, but the associated VOR or LOC is not. The mode switch selects between distance (DIST) or distance in NMs, groundspeed, and time to station. There may also be one or more HOLD functions that permit the DME to stay channeled to the station that was selected before the switch was placed in the hold position. This is useful when you make an ILS approach at a facility that has no collocated DME, but there is a VOR/DME nearby. Some DMEs correct for slant-range error. A DME is used for determining the distance from a ground DME transmitter. Compared to other VHF/UHF NAVAIDs, a DME is very accurate. 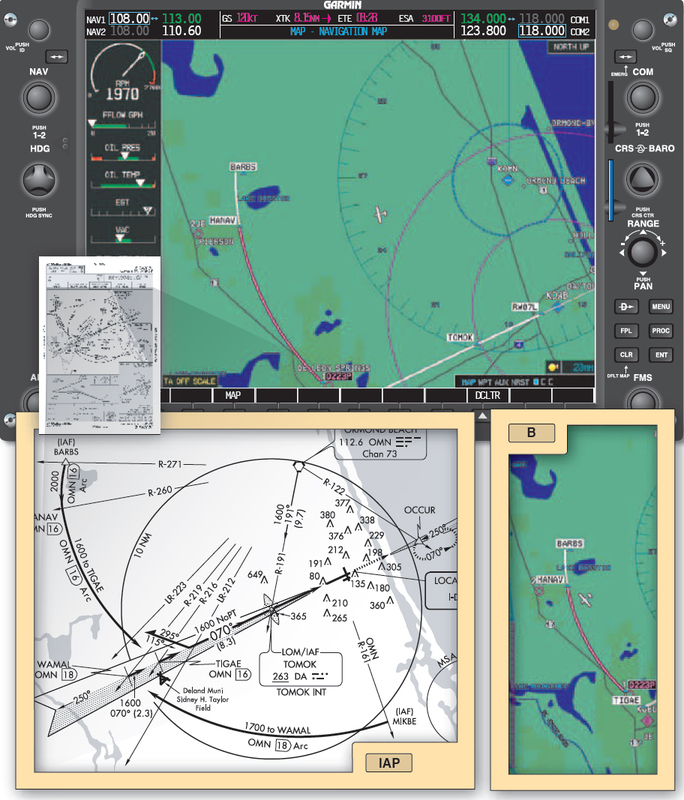 The distance information can be used to determine the aircraft position or flying a track that is a constant distance from the station. This is referred to as a DME arc. 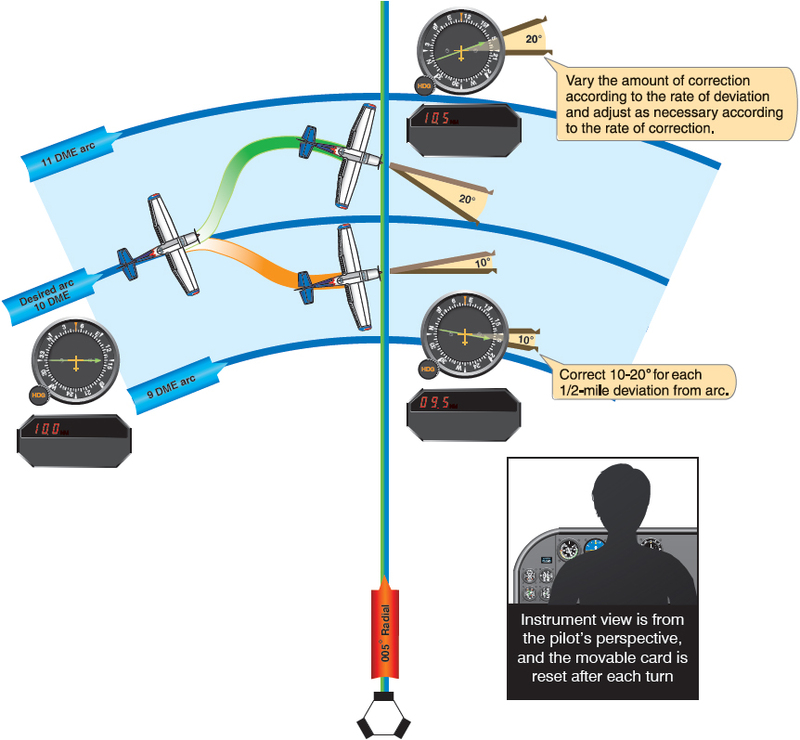 There are many instrument approach procedures (IAPs) that incorporate DME arcs. The procedures and techniques given here for intercepting and maintaining such arcs are applicable to any facility that provides DME information. Such a facility may or may not be collocated with the facility that provides final approach guidance. Figure 9-17. DME arc interception. Track inbound on the OKT 325° radial, frequently checking the DME mileage readout. A 0.5 NM lead is satisfactory for groundspeeds of 150 knots or less; start the turn to the arc at 10.5 miles. At higher groundspeeds, use a proportionately greater lead. Continue the turn for approximately 90°. The roll-out heading is 055° in a no wind condition. During the last part of the intercepting turn, monitor the DME closely. If the arc is being overshot (more than 1.0 NM), continue through the originally planned roll-out heading. If the arc is being undershot, roll-out of the turn early. The procedure for intercepting the 10 DME when outbound is basically the same, the lead point being 10 NM minus 0.5 NM or 9.5 NM. When flying a DME arc with wind, it is important to keep a continuous mental picture of the aircraft’s position relative to the facility. Since the wind-drift correction angle is constantly changing throughout the arc, wind orientation is important. In some cases, wind can be used in returning to the desired track. High airspeeds require more pilot attention because of the higher rate of deviation and correction. Maintaining the arc is simplified by keeping slightly inside the curve; thus, the arc is turning toward the aircraft and interception may be accomplished by holding a straight course. When outside the curve, the arc is “turning away” and a greater correction is required. To fly the arc using the VOR CDI, center the CDI needle upon completion of the 90° turn to intercept the arc. The aircraft’s heading is found very near the left or right side (270° or 90° reference points) of the instrument. The readings at that side location on the instrument give primary heading information while on the arc. Adjust the aircraft heading to compensate for wind and to correct for distance to maintain the correct arc distance. Recenter the CDI and note the new primary heading indicated whenever the CDI gets 2°– 4° from center. With the RMI bearing pointer on the wingtip reference (90° or 270° position) and the aircraft at the desired DME range, maintain a constant heading and allow the bearing pointer to move 5°– 10° behind the wingtip. This causes the range to increase slightly. Turn toward the facility to place the bearing pointer 5°– 10° ahead of the wingtip reference, and then maintain heading until the bearing pointer is again behind the wingtip. Continue this procedure to maintain the approximate arc. 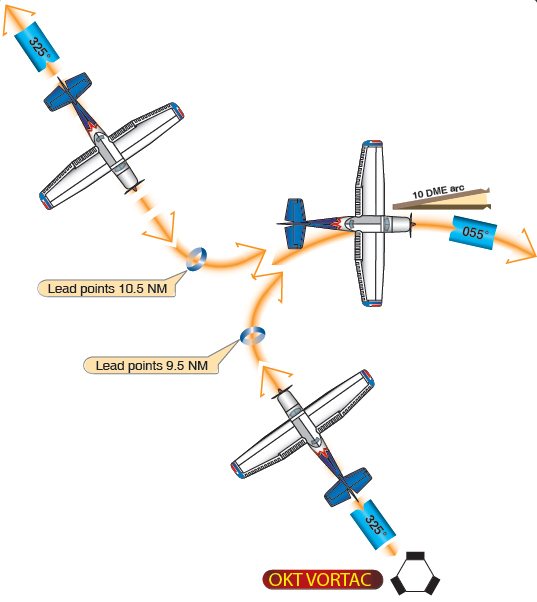 If a crosswind causes the aircraft to drift away from the facility, turn the aircraft until the bearing pointer is ahead of the wingtip reference. If a crosswind causes the aircraft to drift toward the facility, turn until the bearing is behind the wingtip. As a guide in making range corrections, change the RB 10°– 20° for each half-mile deviation from the desired arc. For example, in no-wind conditions, if the aircraft is ½ to 1 mile outside the arc and the bearing pointer is on the wingtip reference, turn the aircraft 20° toward the facility to return to the arc. Without an RMI, orientation is more difficult since there is no direct azimuth reference. However, the procedure can be flown using the OBS and CDI for azimuth information and the DME for arc distance. A lead radial is the radial at which the turn from the arc to the inbound course is started. When intercepting a radial from a DME arc, the lead varies with arc radius and groundspeed. For the average general aviation aircraft, flying arcs such as those depicted on most approach charts at speeds of 150 knots or less, the lead is under 5°. There is no difference between intercepting a radial from an arc and intercepting it from a straight course. With an RMI, the rate of bearing movement should be monitored closely while flying the arc. Set the course of the radial to be intercepted as soon as possible and determine the approximate lead. Upon reaching this point, start the intercepting turn. Without an RMI, the technique for radial interception is the same except for azimuth information, which is available only from the OBS and CDI. The technique for intercepting a localizer from a DME arc is similar to intercepting a radial. At the depicted lead radial (LR 223 or LR 212 in Figures 9-19, 9-20, and 9-21), a pilot having a single VOR/LOC receiver should set it to the localizer frequency. If the pilot has dual VOR/LOC receivers, one unit may be used to provide azimuth information and the other set to the localizer frequency. Since these lead radials provide 7° of lead, a half-standard rate turn should be used until the LOC needle starts to move toward center. A DME/DME fix (a location based on two DME lines of position from two DME stations) provides a more accurate aircraft location than using a VOR and a DME fix. DME signals are line-of-sight; the mileage readout is the straight line distance from the aircraft to the DME ground facility and is commonly referred to as slant range distance. Slant range refers to the distance from the aircraft’s antenna to the ground station (A line at an angle to the ground transmitter. GPS systems provide distance as the horizontal measurement from the WP to the aircraft. Therefore, at 3,000 feet and 0.5 miles the DME (slant range) would read 0.6 NM while the GPS distance would show the actual horizontal distance of .5 DME. This error is smallest at low altitudes and/ or at long ranges. It is greatest when the aircraft is closer to the facility, at which time the DME receiver displays altitude (in NM) above the facility. Slant range error is negligible if the aircraft is one mile or more from the ground facility for each 1,000 feet of altitude above the elevation of the facility.